Heat oil in a large dutch oven type pot. Chop and sauté the onion and peppers until they are tender. Add the beans, including liquid, stir to incorporate with the cooked veggies. Add the remaining ingredients and mix in gently, but completely. Bring the mixture to a light boil, stir and taste the sauce for your desired level of spiciness. You can use cayenne, crushed red pepper, Thai garlic sauce, A-1, spicy barbecue sauce, etc., to bring out the flavor you want. 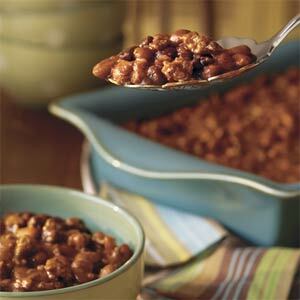 Bake in a shallow corning or glass baking dish in a 350 degree oven for 1 hour or until the beans are bubbly. Let stand for at least 5 minutes. Serve.